Well this interview is for my good friend WangTang. To tell you the truth, I wrote this without interviewing him. Anyways, lets tell you who this guy is. Let's start with the basics. My friend WangTang has been on Ken Rauhel, since the beggining of the server. You might remember his mage named "Summ0ner". 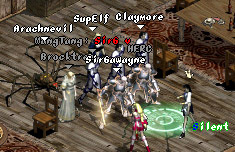 Back in the day, when Windawood was held by the pledge Silent lead by AndrewSaga, Summ0ner was one of the few mages with summon. I was a low level knight in the same pledge and I always envyed his spartoi summons. After a while P2P arrived and I left Lineage. Only a few months ago, Summ0ner had returned. I got sudden whisper and I was delighted that he had returned. Of course friends helped him out to get him on his feet. He played mage for a bit and then went on his elf, UltimateFury. 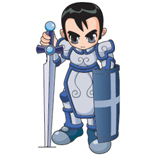 You can call his knight one of the blessed characters of Ken. Heavensfury, his knight created one of the best items on Ken. Everyday I would be whispered by my friend and I was surprised each time. One day he told me he made +6 IB. I later learned he sold it for a +8 Katana and adena. Couple days later I found out he blew his Katana and he was leaving for LOA. Another friend of mine quit, Roopang. He had supported Heavensfury with some items. There he went on a Enchant race creating countless of items. 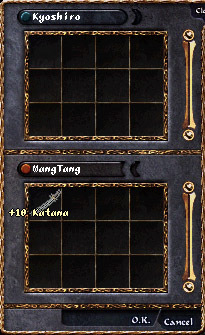 He had bought a +8 Blessed Katana. It later became +9 and then finally +10. Here is present you the Katana. His new knight, WangTang, got the pleasure to level to 48 with it. It soon struck him that he would'nt have anymore time for Lineage. Lineage was also becoming bored for my friend. In effort to Lineage with a blast, the Katana was melted. Couple minutes before I saw him for the last time, he bid his farwells and told me he blew 3 +7 Katanas and a +5 Power Glove. It was a sign Lineage no longer wanted him. go with the flow and blow some more! O.o~~ur making me to ndai my +9bkat now. >< how sad...nice weap~! hope u return one day or find a better life! WaterElf I cant see any idea urs 2 of last interwiewed...1st ur interwied quitted ppl who didnt got anything special lvl 52 and -61 ac is not so rare anymore...and now u interwiew ppl who got +10 b-kat and quitting too... +10 items not so rare anymore all of those no need report I think... also if all reporters interwiew all them quitted friend spotlight would be full of those. So maybe u should think what u writing or give some1 else do thise spotlights...Of course Ultimate was nice guy all luck to him. swiftbolt, go learn some grammar.... i have no clue what you're trying to say man. Complain complain complain. mayb you guys need to think b4 you post..
lol funny stuff. anyways, im bored stiff with interviews of 52+ knights with uber items because they can hunt bosses blah blah blah. it wasnt a bad interview, i just didnt like it because im tired of hearing about people with better luck than me. -.- oh well, i like your interviews water. keep em comming.....but maybe spice them up a bit? I lieked the interview with blessed mortals, and such stuff... its fun to read ppl still find n dai a good drop, and be proud on it. Gives me feelings of when i used to start playing.